We have an exciting lineup of speakers who will share their story and experiences with you. Grant is a New Zealander who, at night as a child in his Auckland brick house, learned to play the ukelele and would accompany his father at the piano. He bought his first guitar around the age of 16 and as soon as he had learnt five chords, immediately tried to 'write' a song. It wasn't as easy as he thought but he persevered. In the spaces between family responsibilities, earning a living as a teacher and writer, (we won't mention interminable Baha'i commitments), he still toys with making music. He has produced six cds of original songs (and three cassette tapes before those). He is the published author of three books, the scriptwriter of three produced NZ feature films, and the composer/lyricist of one stage musical. Grant is married to Jenny and they have two children, Rebeccah and Isaac. They live in a warm house east of Christchurch on a hill overlooking Lyttelton Harbour, in the South Island. Currently, he's working on a new album of songs. Linda joined the Baha'i Faith when she was 17 - many years ago! Since then, she has been guided by the social justice and human rights dimensions of the Faith leading her to work in areas providing support to those who are most disadvantaged in terms of their lack of access to employment, education, and services. This has taken her into areas of action research based on the experience of those who are adversely impacted by systemic problems. Linda has a long list of academic publications regarding these issues and in the last 10 years has become a renowned expert in workplace bullying. She runs a business providing legal opinions for lawyers on psychological health and safety issues which keeps her very busy! Linda is keen to finish a couple of books she is working on, one in the social work area about children in care, another on workplace bullying, and another about the lives of everyday Baha'is in walking the spiritual path with practical feet. Dr June Perkins is a Brisbane-based poet, blogger and children's author, of Indigenous Papua New Guinean and Australian background, raised in Tasmania by Baha'i parents. She utilises multi-arts and multicultural stories to inspire an enriched sense of belonging and compassion in those who encounter her work. She recently shared Magic Fish Dreaming at the Asia Pacific Triennial Pacific, Summer Program 2019 APT9 and became a member of Mana Pasifika research Institute. She maintains an interest and dedication to promoting diversity in the Australian, Pasifika and Baha'i literary landscapes. becoming a journalist. In 1988, he moved to Perth where he became a news reporter, feature writer and foreign correspondent for The West Australian newspaper. Michael is now based in Brisbane where he works as a foreign affairs adviser as well as undertaking other Baha'i history projects. Melanie Lotfali is a graduate of the Australian College of Journalism in Professional Writing for Children. She is the author of twenty three books of fiction and non-fiction for children, and the illustrator of five. She has also published articles in professional journals and online. With a degree in psychology she has worked extensively as a counsellor and is also a qualified classroom teacher. She has a PhD in engaging boys and men in gender equality and for many years has facilitated violence prevention and respectful relationships programs in high schools, and for adults. Leila Deighton was brought up in the small regional town of Warwick, Queensland. She went to school at the Scots-Presbyterian Girls' College in Warwick where she studied Senior Secretarial and Accounting Procedures. After joining the Baha'i Faith in 1960 Leila left Australia to pioneer her Faith in New Guinea in 1962; she later worked for the Universal House of Justice, in Haifa, Israel, the World Spiritual and Administrative Headquarters of the Faith. Leila became the Principal of the Baha'i Permanent Institute in Lae, PNG, in 1996. The First Wave contrasts her life prior to becoming a member of the Baha'i Faith, with her later life as a Baha'i. It is an amusing and light-hearted tale of life in a developing country, with an extremely serious undertone. The First Wave anticipates the coming of a great wave of people, tired of a Godless and fearful society, who wish to embrace a world envisaged by the Prophet Baha'u'llah (The Glory of God) - a world of Unity, Peace and Justice for all. Naysan is the editor of Baha'i Blog and he has worked in various avenues of media for two decades. He's passionate about using the arts and media to support and explore the teachings of the Baha'i Faith, and he has produced and collaborated on numerous Baha'i-inspired projects ranging from music albums and websites to documentaries and podcasts. His experience as a producer for CNN was invaluable while working on a number of special projects for the Baha'i World Centre, including the Building Momentum and Pilgrimage: A Sacred Experience films. If there's a media-related Baha'i project out there, chances are that Naysan was involved with it somehow! Ian has spent more than 30 years pursuing his passion for fine-art nature Photography; initially inspired by his childhood curiosity of the natural world. His interest in both photography and the natural world led to a decade long project photographing the volcanic landscape, and in course publishing three books on the subject; Journey through Java (2009), Hot Earth: New Zealand's Geothermal and Volcanic Landscape (2017), and Echoes in the Dark; Volcanoes of the South Seas (2018). Drawing on the spiritual writings of his Faith for inspiration would see Ian publish Edge of Light: Selected Writings of the Baha'i Faith (2016). In this book Ian draws on the spiritual allegory of Light juxtaposed with his revealing images of the beauty of the natural world. 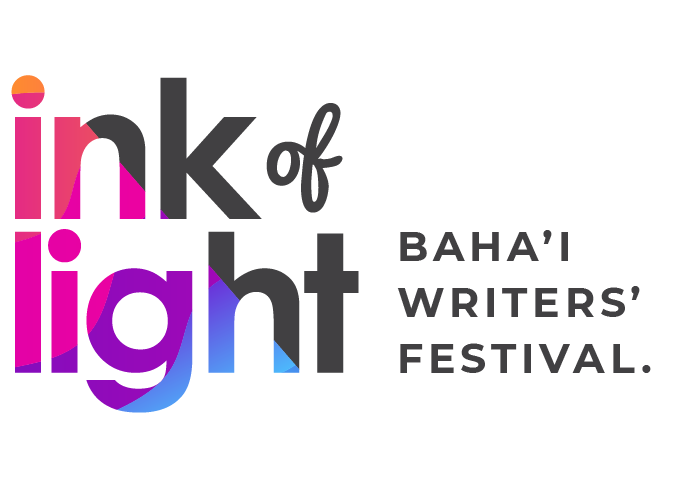 His present work in progress is Parallel Forces of Light; The Baha'i Faith and the Advent of Photography, which developed out of a talk he gave at the inaugural Ink of Light Writers' Festival. Afsaneh Varzaly holds an undergraduate degree in engineering from Purdue University and a graduate degree from Stanford University in aeronautical engineering. While studying at Stanford she was a recipient of a Zonta International, Amelia Earhart Fellowship, and was a research assistant at the Joint Stanford - NASA Ames Research Institute. Following her graduation, she worked as a research engineer at General Electric Company and was the author and co-author of numerous technical reports. It was not until Afsaneh began raising her two children that her interests in human behaviour and interpersonal relations strongly emerged. As a result, while still living in California she became well read on these topics and actively attended seminars and workshops on parenting. While it was a joy to raise happy and successful children, she found the experience to be more challenging and gratifying than engineering work. In the process she realised that living a life grounded in moral values and virtuous behaviour and focused on being of benefit to others is conducive to happiness and contentment. Her interests in exploring the source of meaning and contentment in life led her to write her first novel, I Will Not Cry; Undiscovered Greatness. Michael Cohen currently serves on the Distribution and Publication Board which manages Baha'i Distribution Services and Baha'i Publications Australia. Michael is the author of the Reflections on Reality series. He graduated as a computer Systems engineer in 1990 and worked for many years in software design and information systems. He changed careers in 2008 to become a Registered Nurse working in the area of Mental Health. Michael is also an advocate for programs offered by the Foundation for the Application and Teaching of the Sciences (FUNDAEC), and the Institute for Studies in Global Prosperity (ISGP). A fundamental premise of Michael's worldview is that true science and true religion are necessarily in harmony. His writing seeks to promote understanding of this liberating concept and to contribute to a civilization that is ever advancing materially and spiritually. He currently lives in Lismore, Australia, with his family. Michael has produced two titles: The Big Story: Challenging the Dichotomy of Evolution and Creation. And The Divine Plane: Integrative and disintegrative Forces in Society. Born in Little Rock Arkansas USA, Keithie received her primary school education in the Solomon Islands and Brisbane, before attending High School in Adelaide. She has pursued a diverse career path, which includes a studying a Bachelor of Nursing, running a business, Cordon Bleu cooking, and hosting cooking and travel tv shows. Presently she is the appointed United States Consular Agent to the Solomon Islands. In 2010 she received an OBE in recognition of her community and environmental work in the Solomon's. She is a patron of the, 'Solo Enviro Beautification', Solomon Scouts and Coastwatch, and Solomon Islands Writers Association and the author of, Of Wars & Worship; the remarkable story of Alvin and Gertrude Blum', which is now in its second printing. $15 per ticket for a 2-day event. 18-19 May 2019 - Brisbane, Australia. Join the Facebook group and subscribe to get updates from the Ink of Light team. Thank you! You've successfully subscribed to our newsletter.